This is all about zombie ants and their resemblance to mediatized-hypnotized human beings of today. 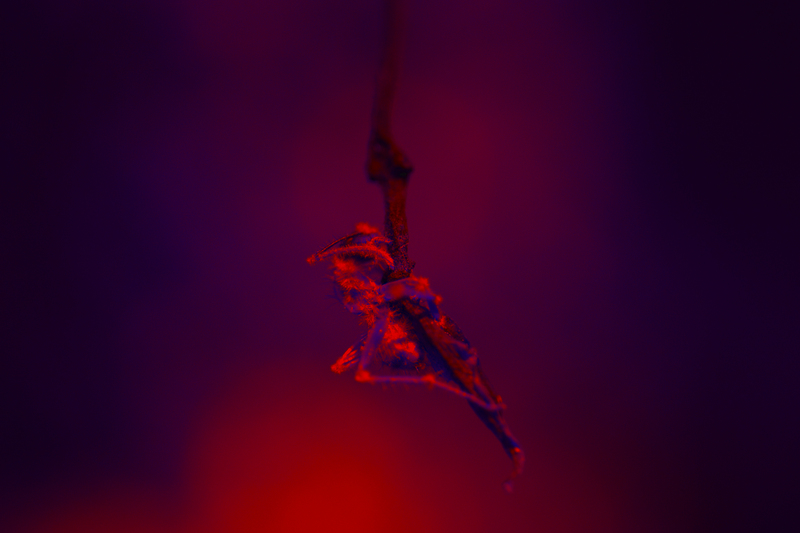 viral ecologies : technologic hypnotism and the zombie ants is the first chapter of an interdisciplinary project of mine focused on the experimentation with different media to visually explore the true omniscient phenomena of viral ecologies, both in the algorithm as in the organism. The idea of the project started in summer 2014 as part of a workshop I designed and imparted at Universidad Nacional in Bogotá about similarities between the behaviour of certain tropical ants and the manifestation of self-organization and decentralization in human-made technology. Similar and strange, transcendental phenomena takes place during the generation of affection-infection-imitation-contagion cycles both in wetware as in software, in other words in the life of the living (natural) and the undead (artificial). More on this intriguing matter will be revealed during this residency. 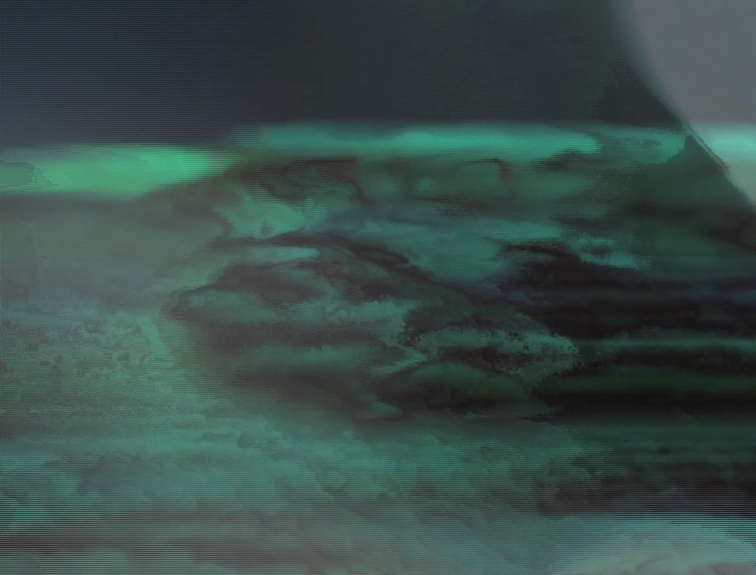 Technically, the intention of this digital residency is to bend/mosh/glitch both data and fungal specimens by means of a, let's say at this instance, universal manifestation of decomposition that can affect everything. 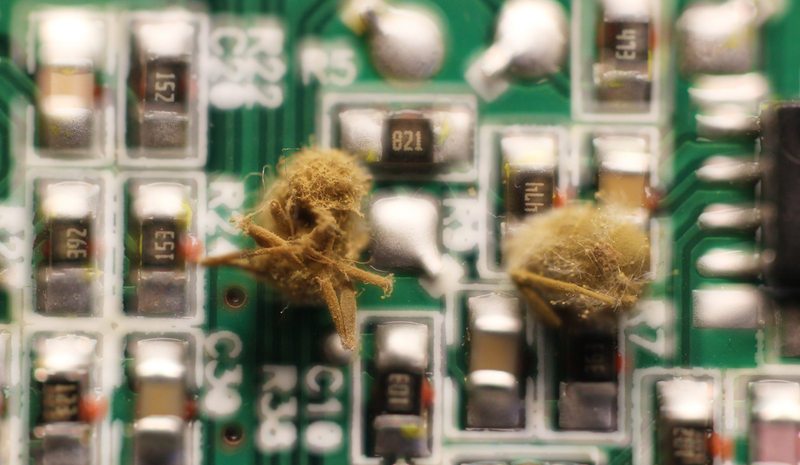 I will try to incubate a parasitical fungus which can also infect a computer program which is constantly trying to allocate memory in order to render images. 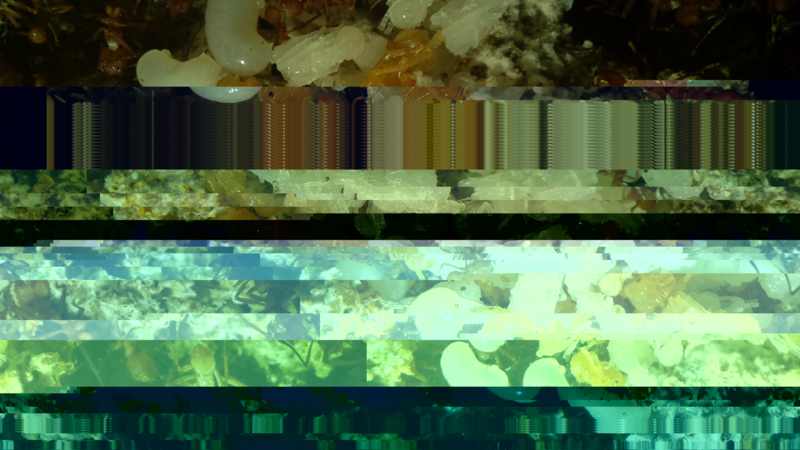 A glitch presence infecting an image, affecting the system. Yet, more bewildering is the fact that the bullet ant is the host of a parasitic fungus which penetrates her exoskeleton, infects her brain and takes control of her movements...turning the giant ant of the Amazon into a zombie ant. Researchers claim to have found the first evidence of 'zombie' ants in the fossil record. 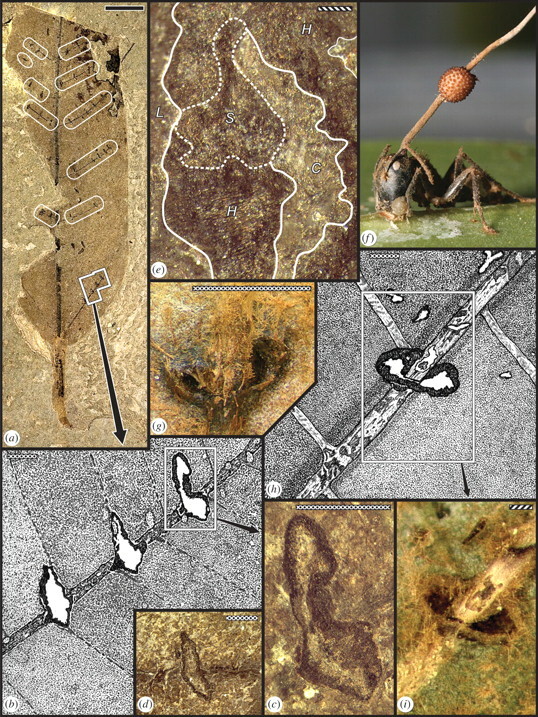 They have matched peculiar cuts on a 48-million-year-old fossil leaf with the 'death bites' made by modern ants infected by a fungal parasite. The leaf was part of a group of fossilized leaves and plants unearthed recently from the Messel Pit in Germany's Rhine Rift Valley — an area famous for the discovery, in 2009, of Ida, a well-preserved primate fossil touted as a human ancestor. Initially, the fossil plants and leaves did not raise much interest and they were stored for years at the Smithsonian Institution's National Museum of Natural History in Washington DC. 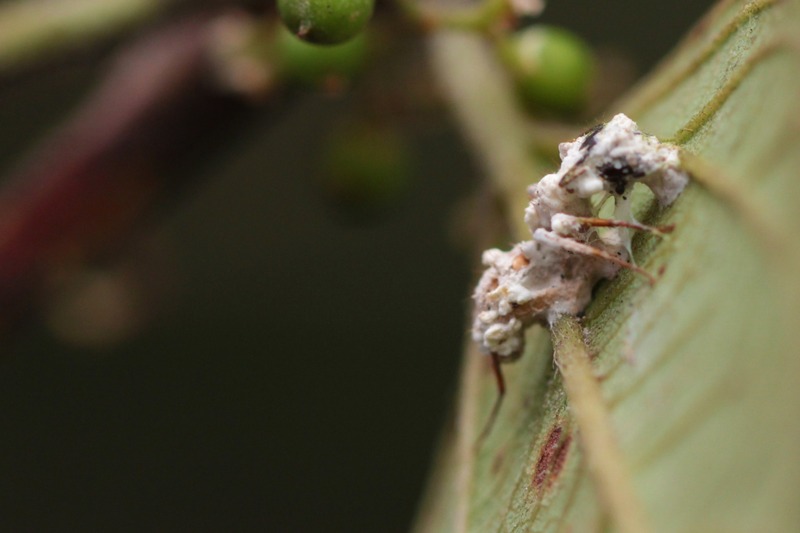 In Thailand, Hughes had seen leaf bites produced by carpenter ants, Camponotus leonardi, that were infected and manipulated by a fungus, Ophiocordyceps unilateralis. 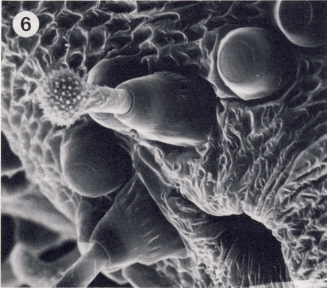 In this parasite–host relationship, the fungus manipulates the insect's behaviour so that the ant bites into the underside of a leaf. The conditions under the carefully chosen leaves are optimal for fungal growth. 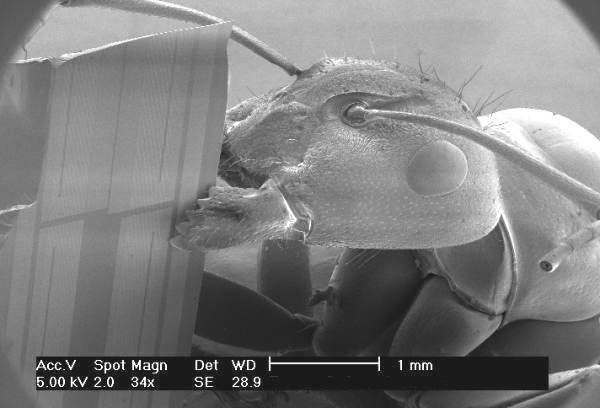 After the ant bites into a leaf vein, the fungus grows rapidly, covering the ant in a dense mat of filamentous fungal hyphae. 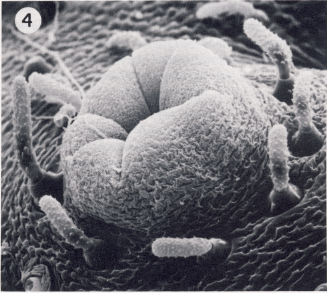 The fungus then releases spores to infect more ants. (a) A nearly complete fossil leaf (SM.B.Me 10167) from Messel with 29 ant death-grip scars centred on 11 secondary veins (rectangular templates). (b) Overlay drawing and enlargement of three of four scars of (a) showing shape, callused periphery and relationship of secondary to tertiary venation. (c) Enlargement of upper–right scar in (b), showing dumbbell-shaped hole and central concavity of callused tissue. (d) Additional but narrower scar with less pronounced dumbbell. (e) Detail of a scar from the fossil leaf at (a), showing unaffected leaf tissue (L); callused region showing hyperplasic cell files radiating from central cut (H); texturally distinct fungal infection of callused tissue seen on the surface (S); and central cut area (C). (f) Modern plant specimen , showing a mature O. unilateralis stroma issuing from the head of a dead C. leonardi whose mandibles are attached to the lower surface of a major vein. (g) Modern ant death-grip scar from a primary–secondary vein axil, showing the medial vein, dumbbell-shaped hole, callus rim and hyphae from later fungal colonization. (h) Overlay drawing of a second, modern leaf specimen with a death-grip scar at secondary and tertiary axil; other holes may be aborted mandibular punctures. (i) Photo showing same features in (h). Scale bars: solid bar, 1 cm; stippled bar,1 mm; slashed bar, 0.1 mm. 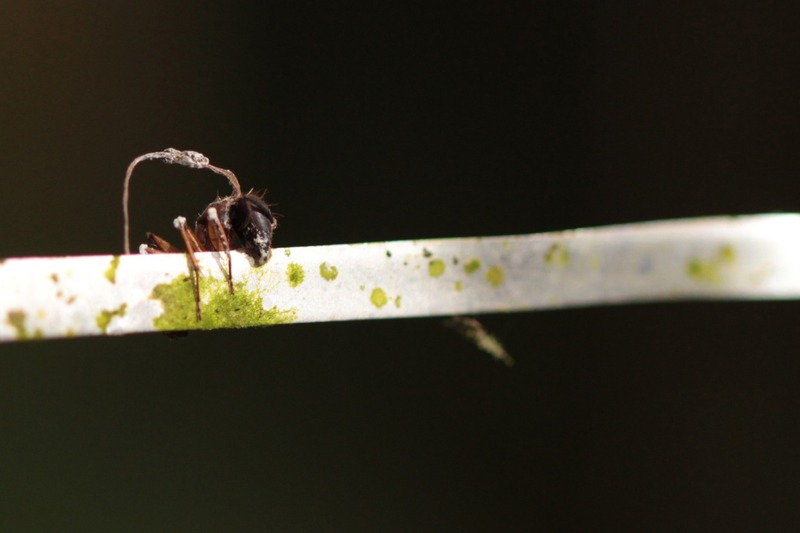 Zombie carpenter ant, genus Camponotus, photographed by the artist clinching onto an aluminum strip used to label tree species in the Yasuni rain forest of Ecuador, 2013. Zombie ants are a natural phenomenon. They do exist. But the term has few to nothing in common with zombies in film or literature. 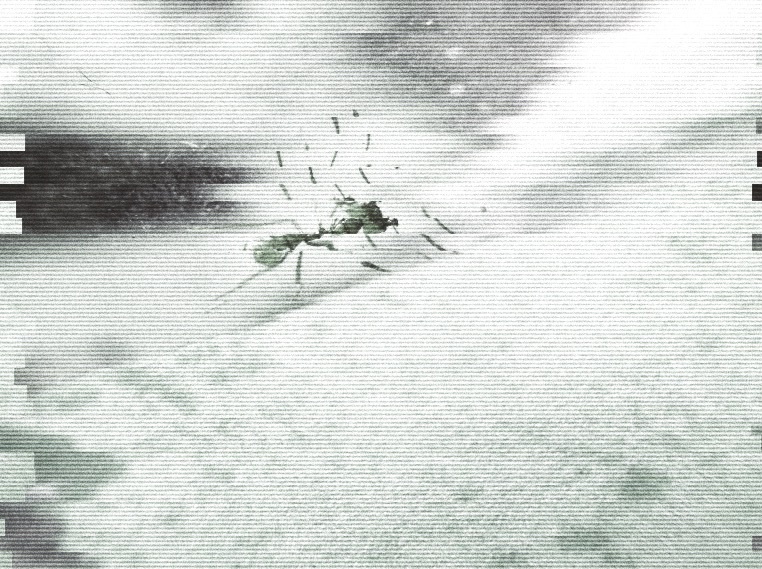 The behaviour of infected zombie ants does not resemble the movements or intentions of those post-apocalyptic post-human creatures we love and fear. A zombie ant does not bite another ant. Yet what the cultural phenomenon of zombies really has in common with the natural zombie ants is the virality in the relationship between host-parasite, i.e., the contagious nature. Indeed, the portray of zombies in general demonstrates their existence and propagation is to an extent symbiotically dependent on normal/rational humans to become infected, to get bitten; in other words, the zombified brain needs a healthy brain, a host. They do also share -perhaps, if your imagination allows it for a moment- a folkloric resemblance to the zombii of Haitian Vodoo. A zombie ant is actually enslaved, like the zombii in Haitian voodo. The parasite Ophiocordyceps unilateralis physiochemically controls the ant's brain and manipulates her movements to climb and bite leaf stems (the leaves do not get infected, but in this way the parasite bursts from the head of the ant and sends a rain of spores from above which infects other ants passing by). This is my point of departure to link the Haitian zombii phenomenon with the zombie ant, aka Ophiocordyceps unilateralis' enslaved ants. We travel between the two brains and find a chemically common denominator: the CBP gene in ants is susceptible to acetyl compounds, and exposing it to more or less of it will define what kind of work the ant will do in her life: working on the fields or in the security of nest; now, in the ceremony of zombification the bokor (the voodo priest), administers Datura, an hallucinogenic tropical plant which affects a chemical known as acetylcholine in the human brain, thus allowing him to control/influence the volition of the recently turned zombii, with the sole purpose of enslaving the subject to work on the fields for his new masters. 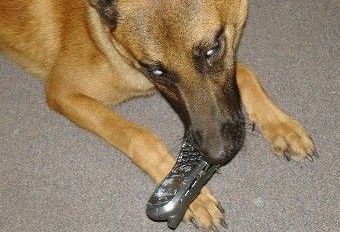 How far can we go without technology? How do you find the nearest route to the d᷿͓᷿᷿᷿᷇̏r᷿᷿̩᷿᷿̄ͧǔ᷿᷿͍᷿᷿͟g᷿̣᷿᷿͎᷿͒ ̸̧᷈ͬ̔᷈ s̷̷᷇t̷̷̘o̷̷̷͚ͥr̷̷ͦe̷̷͒? How do we find the nearest path to our food without Google, GPS, without internet? Do you still know how to use a compass? how can you not call it Zombie? 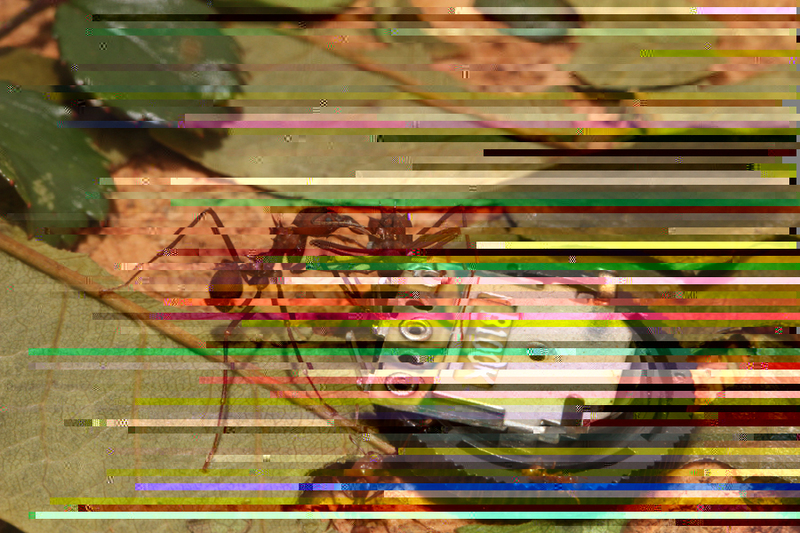 The following 2 videos were a product of a 10 day progressive time lapsed encoding of the fungus garden of my colony of Acromyrmex octospinosus, using Antonio Roberts' python scripts which exploit avconv encoding capabilities, on a Raspberry Pi 2. This ant of the genus Dolichoderus has been infected by an unknown parasite. It was long dead, its exoskeleton dry and decaying when I took the photo. Original photo taken by the artist in the Yasuni rain forest of Ecuador, 2013. Not a zombie, but this ant of the species Gigantiops destructor is a solitary hunter and they move very fast, jump over obstacles and are incredibly agile over the rigorous terrain of the tropical rain forest. 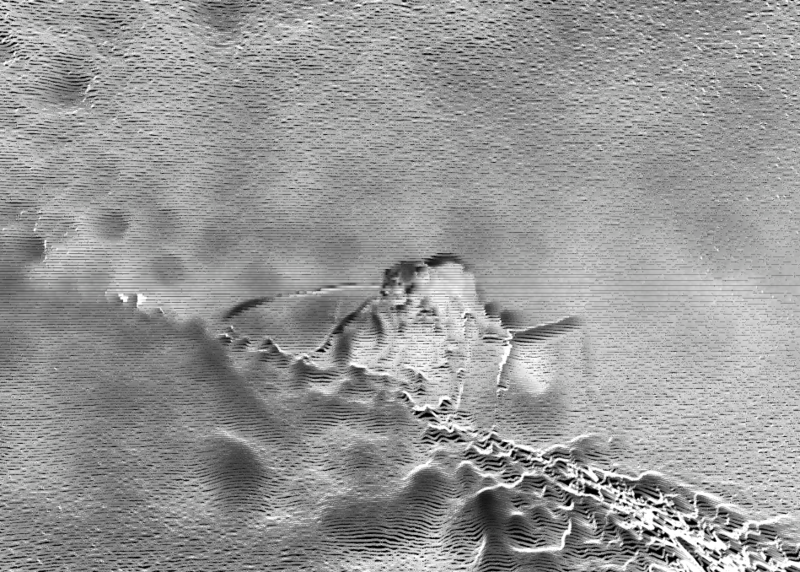 This picture was digitally possessed with this online tool (http://airtightinteractive.com/demos/js/ruttetra). Original photo taken by the artist in the Yasuni rain forest of Ecuador, 2013. "The now-ubiquitous animated GIF (Graphic Interchange Format) image has been revived on the internet 25 years after it was first designed by Compuserve [...] moving GIFs express newness through the medium of the explicitly old. Seen as the quaint markers of a pre-Flash world wide web, GIFs’ ongoing renaissance over the past half-decade places them in an online context that marks their vintage aesthetic difference as a notable appeal rather than an intrusive deficiency GIFs have become so pervasive to have merited categorization, as well as explanation and analysis. [...] there is even a relatively significant contingent of people creating and theorizing GIFs as art, which indicates that the form has finally arrived — perhaps to a point where many begin to wish it had never started to come into the zeitgeist at all. The species of this ant is unknown to me. The white fungal sheath coating her body is of mysterious origin. It was long dead when I found her. Original photo taken by the artist in the Yasuni rain forest of Ecuador, 2013. Charlotte Sleigh, “Empire of the ants: H.G. Wells and tropical entomology,” Science as Culture, Vol. 10, No. 1 (2001): 33-71. H. G. Wells, Empire Of The Ants (London: The Strand Magazine, 1905). Timothy Verstynen & Bradley Voytek, "Do zombies dream of undead sheep? : a neuroscientific view of the zombie brain", Princeton Univeristy Press, 2014.